The Blunt Bean Counter: Newspaper Paywalls - The Future or the Last News Stand? Newspaper Paywalls - The Future or the Last News Stand? This is my last official blog post of 2012, (I will announce the winners of the book giveaway on Wednesday) so I would like to wish my readers a Merry Christmas and /or Happy Holidays and a Happy New Year. See you in January. Over the last few years, there has been a growing trend amongst newspapers to implement paywalls. Papers moving forward with paywall initiatives include such prestigious papers as the New York Times and Wall Street Journal. As described in this Wikipedia link, a paywall is a system that prevents Internet users from accessing webpage content, most notably news content, without a paid subscription. I find this transition fascinating. The change falls somewhere in the middle of being a sustaining technology and a disruptive technology – if one could apply technological jargon to this situation. There are alarming similarities between the transformations the newspaper industry and music industry have been forced to undergo in the last 5 years or so. While the revolution in the music industry may have been more radical and accelerated, it is still similar in many ways to the changes newspapers have had to make in order to survive. Music in many forms became freely accessible to the public (whether legal or not is another discussion). 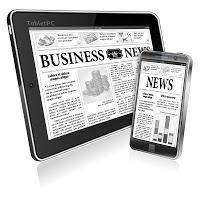 Many newspapers and other Internet sources have been providing free access to news, sports, and entertainment etc. for several years now. The music industry could not stop/or unwillingly let the genie out of the bottle and Apple, via iTunes, capitalized by providing a low cost music option in the legal download world. Newspapers are now trying to shove their genie back into its bottle by creating paywalls and charging for access to online news. The entire newspaper industry seemingly overnight is battling a societal shift, in which consumers expect free online content and are very hesitant to pay for such information. It is interesting to note that in Toronto, two popular free newspapers, The Metro and 24 Hours, are owned at least in part, by the owners of the Toronto Star and Toronto Sun respectively. The Globe and Mail (“G&M”) recently went to a paywall when it launched its Globe Unlimited digital subscription service for its Globeandmail.com website and apps. The other three Toronto papers have also announced paywall intentions for 2013. 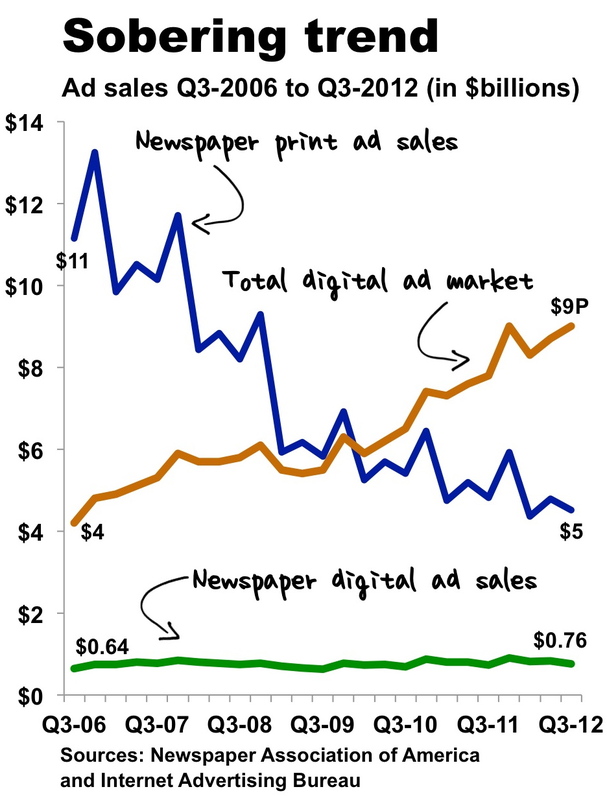 While paywalls result in extra revenue for newspaper companies (charging for online content or creating demand for hard copy subscriptions), that revenue is often negated at least in part, by a decrease in advertising revenue. According to this article in the International Business Times , the New York Times increased subscription revenue by 8% in its second quarter of 2012 including paywall revenue, but had offsetting advertising revenue losses of 7%. This July, 2011 article reflects how the implementation of a paywall can radically decrease online traffic once it goes up (it is my personal uneducated opinion that these numbers are understated as many papers offer some free online content or allow for a certain level of free visits that distort the true loss of readership). I would have liked to have been a fly on the wall when the NY Times held their initial meetings discussing the business case of implementing a paywall. You can imagine a boardroom filled with marketing, accounting and newspaper people, all with different agendas and ideas, sitting around a table trying to figure out if they will lose 10% or 40% of their online readers and how many readers the paper will require to become paid online or newspaper subscribers to compensate for the immense loss they will incur in online and hard copy advertising revenue. The revenue discussion does not even account for the issue of whether the people who stop visiting your site once the paywall is established, will ever return to your site for any free online content. As noted above, the G&M recently implemented a paywall. They used the following pay structure: G&M newspaper subscribers were granted free online access. Casual online visitors are allowed up to 10 pieces of G&M content per month for free, after which they need to subscribe to Globe Unlimited or they will not be able to access anymore articles for that month. A Globe Unlimited trial is available for 99¢ for the first month, after which the cost is $19.99 per month. As a G&M newspaper subscriber, I have free online access. If I decided to stop my newspaper subscription, I would pay the $19.99 per month. However, I am an avid newspaper reader for both personal enjoyment and because I need to stay abreast of what is happening financially because of my blog and profession. However, I am not sure in this day and age of free content that everyone feels the same. It will be interesting to see how the various Toronto papers’ paywall implementations are accepted or rejected by their readers. Their reaction will shape those newspapers and the Canadian newspaper industry for a long-time to come; or possibly a short-time to come, for those with less than compelling online content. P.S. For those visually inclined, check out this interesting infographic on paywall trends. Newspaper paywalls are too expensive for me. I am willing to pay $20 a month, but not for only one paper. If I could get the Globe and Mail, National Post, and another US paper, say the NY Times for $20 a month I would subscribe. @Anon-interesting concept, I wonder in the future if competing papers will form alliances? @Mary-I am sure if the G&M marketing department reads this, your words are music to their ears. I think the 10 article restriction is intended to frustrate and cause people to give up and pay, not be altruistic and allow for 10 free viewings. The truth that most news "content" is worthless. Worse yet, and unlike songs, most is interchangeable -- if one guy puts up a paywall, you can get the same news elsewhere for free. One of the few worth paying for is The Economist, since you get thoughtful analysis, and iPad edition and an audio version. No wonder they're one of the few making money. One interesting dilemma for the newspapers is that they generally need to rely on cookies to determine how much of your free article quota is used up. Since most browsers now include a 'private browsing' mode, it is a simple matter even for non-technical readers to defeat this mechanism and have unlimited free articles. Or they can go the route of only offering partial articles for free, but then how much of your readership do you lose, as you discussed in the post? I'm guessing most. What a weird infographic... who uses a pie chart to show a year-over-year increase? Anyway, I think the biggest problem with the paywalls is the price point. When the ads popped up for Globe Unlimited at $1/mo I thought that was fair... but then the fine print said it was just the first month, and it was $20/mo after that. Screw that noise. I have to wonder if the Star and Post have seen traffic increases since the G&M paywall went up, and if one of them will decide to scrap their own plans for a paywall and keep the traffic in the end. @Anon – Interesting point about the duplicity of most news items. To your point, when you think about it, you often see the exact same guest article in two different papers on the same day. @Nathan – I had read somewhere that many people were getting around the NY Times paywall, I guess that is how, now even us non-techies know how. @Potato – No doubt that the Star and Post have seen traffic increases since the G&M paywall went up. You raise a very interesting tactic; say the Post says why fight the big boys and scraps their plans for a paywall; would the free traffic and I would suggest it is substantial, bring in sufficient online revenue to make up for the lost paywall revenue? Based on what I have read, the answer is probably not. In the end, it comes back to compelling content at a fair price point. The problem with paywalls for me is the price and the security of payment. I only read 2-3 articles a week in the Globe and Mail, 4-5 in the Star, and 1-2 in the National Post. I would accept a system where each time I click to read an article, it gets counted on a central website somewhere and a very small fee (maybe 10 cents) is debited from my account. I'd have to top up the account periodically, like a Tim's card or a phone prepaid card. I don't want a costly subscription to each newspaper or magazine since I'm not interested in most of their content. And I don't like leaving a credit card trail on a variety of different sites. Some central billing service would solve both of those problems for me. I'm also not sure how paywalls affect comments. If you want to go back and read the comments a few times for the same article, do you have to pay/count that as a new article "read" each time? I guess the next two or three years will decide whether paywalls work or not. Really like the central depository website idea. Probably would take to much co-operation, but maybe the papers will come up with something similar if paywalls are not the panacea they hope for. I suppose in a few years both of us will wonder why we didn't create the company that offers this option, especially when it gets bought out for millions of dollars by MicroSoft or Google or someone! As a young adult and a dad of 2 I have two thing to contribute to is blog. 1st get a good understanding of RRSPS, TFSAs, taxes, and pension amount. Just learning about those 4 subjects will get you a long way. I also find the best way to learn is try to teach someone once you have learnt the difference. It's amazing how many people out there no nothing about 1 or all of these subjects. Being a dad I am constantly looking for ways to educate my kids about COINs without without just out right giving it to them. The hardest thing to get past so far is just learning to take care of their stuff. Once I get that down then I can go on to teaching them the stuff costs coins. I've started an RESP for the and bought some DRIP- able stocks for them in their name. as always the end goal is to teach them how to fish vs giving them the fish. For the cost of a library card( $12/yr in my case in Edmonton), I get online access to the complete print versions of newspapers around the world, so I have no need to subscribe to the traditional print version or pay fees for access to articles on websites.